You are here: Home / Family Living / Household Hacks / 11 Household Organization Tips! 11 Household Organization Tips! Inevitably every year we try to find ways get more organized. Sometimes just the small things we can do with stuff that we already have around the house can make a huge difference! These tips and tricks can be done with things you already own or you can get them very inexpensively! I don’t know about you, but the battle against clutter is a constant struggle at my house. Especially with all the little things that can collect on counters and every little corner. BUT, I have a secret weapon to fight the clutter and you can find them at almost any Dollar Store or Target: Small (shoebox size) bins! With a lid or without a lid, they have worked wonders to organize every room. Learn how to organize (the heck!) out of your house using plastic storage bins with these 11 Household Organization Tips. Let’s start in the kitchen, shall we? I bet you haven’t thought of using storage bins inside your fridge. But they are so useful! Just like the drawers in your fridge, you can use a storage bin for small items such as string cheese, butter or yogurt cups. Bonus – little kids will easily know where to find approved snacks on their own. The freezer is also a great place to organize with a storage bin. If you happen to stock up on bags of frozen veggies, freezer packed meat, or even butter, you can keep them all in line using a storage bin. My pantry is my favorite place to use storage bins. There are so many small things that can get completely lost in the pantry, such as packets, snack bars and squeezies for the kids. You can even use stackable bins, like I have, to make the absolute most out of your vertical space in your pantry. The laundry area can be a bit of a catch-all. Organize soap samples and other items in small storage bins for easy access. I also use a storage bin to collect lint and throw it away in the actual trash can periodically. My love affair with storage bins started with my personal hygiene supplies, but went into overdrive when I had a baby. Babies have so many small things that can create havoc. Tiny socks and hair bows for girls are perfect to keep in a storage bin. If you’re lucky you can even find storage bins that fit inside the baby’s dresser drawers. 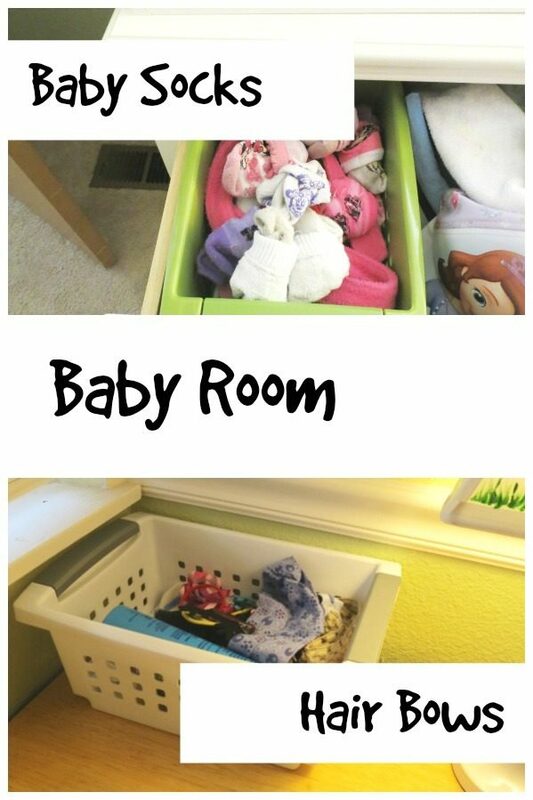 You can also use storage bins to organize diapers and supplies like rash cream, brushes and nail clippers. You can organize the playroom using storage bins to maximize the space you have. Use storage bins to organize puzzle pieces, blocks, LEGO, crayons…just about any small toy would benefit from being stored in a storage bin. If you live in a small house, like I do, then you know that counter space in the bathroom is a premium. But women love makeup and beauty products! 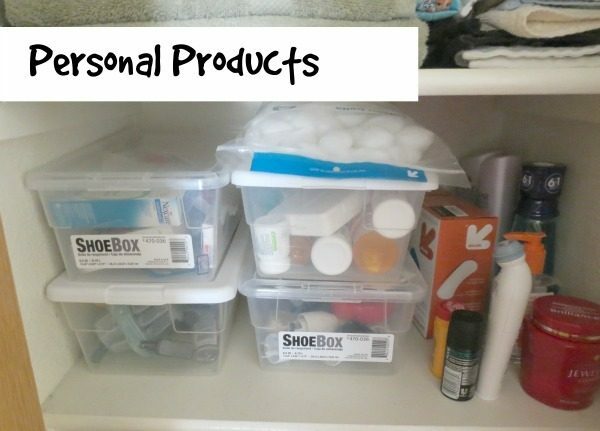 I use a storage bin for all my daily makeup products and keep it above my medicine chest. It is out of the way and also inconspicuous in the bathroom, so it’s not an eyesore. This is the first place I really invested in storage bins. If you only use bins in one place – use them here. I swear you will save so much space (and sanity)! I have a storage bin for all my travel size items, soaps, razors, medicine and first aid. 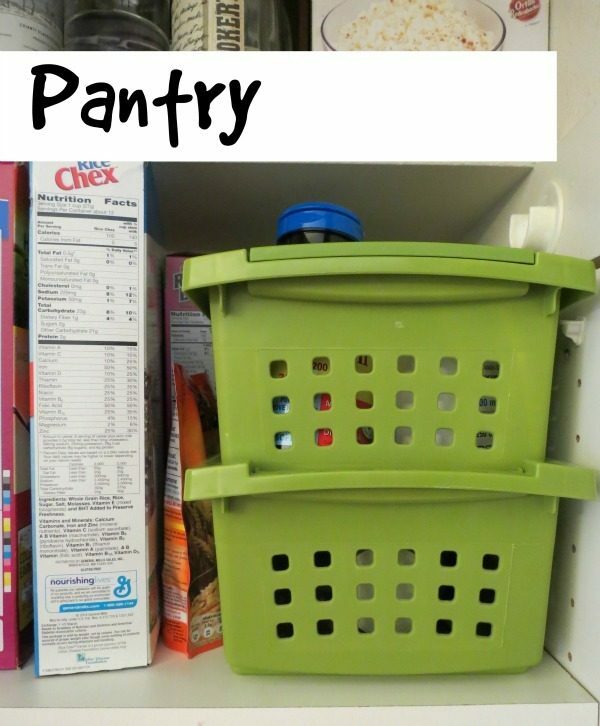 You can even use the storage bins with lids and stack them to save even more space. You can also get the man in your life involved with your new storage bin obsession. They work great in the garage to hold small tools, nails, duct tape… you name it. I think this is where I have the majority of my storage bins. I don’t have an office or a craft room, so I need to be strategic about where I keep all my supplies. They also have to be inaccessible to kids. I keep all my craft supplies in storage bins at the top of my closet. Like I mentioned earlier, I don’t have a separate office in my house, so I keep all my stationery, scissors, pens, pencils, tape, etc in storage bins in my closet with my craft supplies. It works wonders since I don’t need access to them all the time. 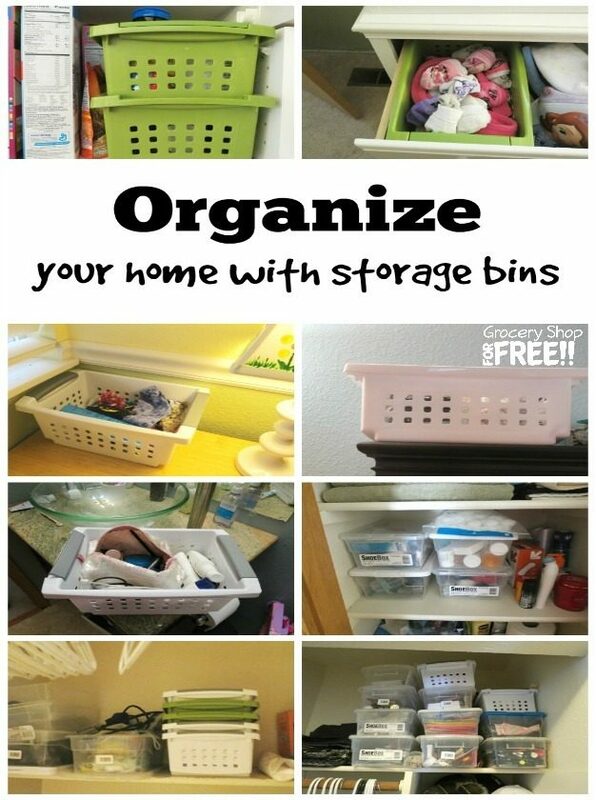 I think that is just about every room in the house that you can improve with a storage bin or two. Let us know what else you use storage bins for in the comments. Kristen is a 30-something Mommy to 2 darling girls, 3 year old Jordan and 1 year old Madeline. She loves reading, writing, trying new beers with her husband and binge watching series on Netflix. She blogs at PracticalMommy.com – a place for moms to learn short-cuts to make their lives easier. That includes everything from Parenting Advice, Simple Recipes, Easy Crafts and easy DIY (really, really easy! ), and quick video tips. You can find her on my favorite social networks Pinterest and Facebook.